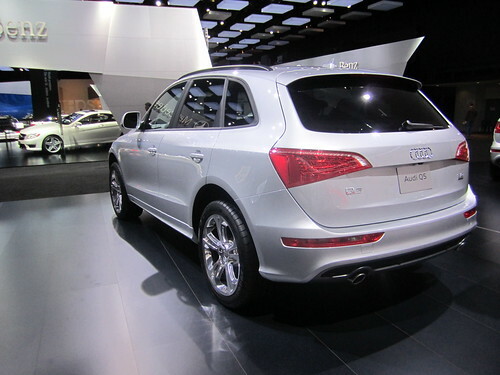 The 2012 Audi Q5 comes with a choice of a 2.0-liter turbocharged four-cylinder or a more expensive 3.2-liter V-6. The smaller engine delivers 211 horsepower while the V-6 churns out a total of 270 horsepower and accelerates from zero to 60 mph in under 7 seconds. The 2012 Volvo XC60 is available with a 3.2-liter six-cylinder engine producing 240 horsepower, or a 3.0-liter turbocharged engine that delivers 300 horsepower. The base model is front-wheel drive, while the uplevel T6 and T6 R-Design trims are all-wheel drive. Fuel economy varies according to the engine chosen, but averages about 27-mpg highway on the Audi Q5 and 25-mpg highway on the Volvo XC60, giving Audi the edge in fuel economy. The single frame grille on the Audi Q5 captures immediate attention, giving the vehicle an aggressive look while keeping the model in line with the overall appearance of other Audi models. The 2012 Audi Q5 features pivoting headlamps, LED taillights, and excellently designed LED running lights. The 2012 Volvo XC60 comes standard with roof rails and a choice of 17-inch or 18-inch alloy wheels. Both models have anti-lock brakes, daytime running lights and a series of performance packages from which to choose. Both the Audi Q5 and the Volvo XC60 are quite spacious considering the smaller, five-passenger capacity. All Q5 trims include a leather-wrapped, multi-function steering wheel with audio controls. Audi Q5 also has 12-way power front seats, dark brown walnut wood inlays, leather seating surfaces and red LED ambient lighting in the front console. Looking inside the 2012 Volvo XC60 one finds a power driver’s seat, optional heated rear seats, 40/20/40 split-folding rear seats, electronic climate control, cabin filter, and a laminated panoramic roof. Volvo XC60 comes with SiriusXM Satellite Radio and a six-month subscription, while the Q5 has a Homelink remote transmitter, the Audi music interface with iPod and iPhone integration, and a similar subscription package for SiriusXM Satellite Radio. Both the 2012 Audi Q5 and the Volvo XC60 include the very latest in safety engineering and technology. All Q5 trims are equipped with front, seat-mounted and side curtain airbags. The Volvo XC60 has a full set of airbags, roll stability control, collapsible steering column, and a rear fog light. 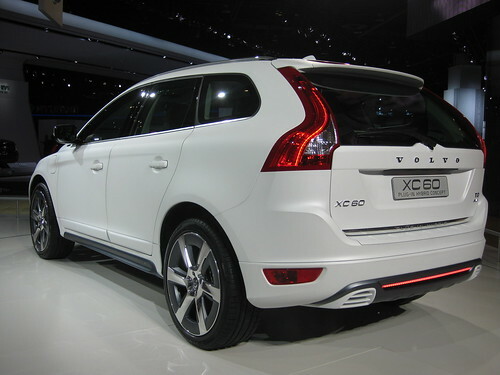 The 2012 Volvo XC60 has an advanced rollover protection system and side-impact protection system. The 2012 Audi Q5 features a front passenger occupant detection system for the airbag, automatic pre-tensioning seatbelts, and belt force limiters on the rear outboard seatbelts. Both models have additional safety features such as anti-theft deterrent systems and lane departure warning systems. Some of these are optional and part of a performance or safety package. The 2012 Audi Q5 starts at around $36,500 while the 2012 Volvo XC60 has a base price of about $33,300. Both models retain their value quite well. When comparing Audi Q5 vs. Volvo XC60, keep in mind that both vehicles are available in numerous trims, with special performance packages affecting the final price with more fully optioned models topping $40,000. In our opinion, the 2012 Audi Q5 is a superior model in base form but the Volvo XC60 gets the edge when you move up to the turbocharged engine. Volvo will also soon be offering a plug-in hybrid version of the XC60. Which is your pick? Please cast your vote in our poll below.